In April, Artistic Nail Design senior educator Zoe Vokis applied Artistic Rock Hard Nails on Shirley Manson, the lead singer of the band Garbage, during Manson’s trip to Sydney, Australia. In April, Artistic Nail Design senior educator Zoe Vokis applied Artistic Rock Hard Nails on Shirley Manson, the lead singer of the band Garbage, during Manson’s trip to Sydney, Australia. Vokis gave Manson a full set of the new Artistic Rock Hard Nail tips. Since she was in need of a fill, Vokis used a combination of Artistic Rock Hard Nails Liquid and Powder. 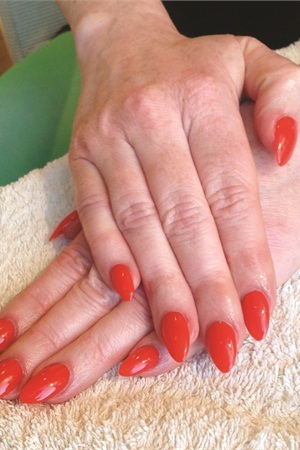 After reshaping her stiletto nails, she performed the fill and completed the service with Artistic Nail Design Colour Gloss in Sultry — a bright orange hue from the upcoming What Kind of Woman Are You? Summer Collection.